Details on the options available to vendors when creating a license for an end customer's upcoming installation. 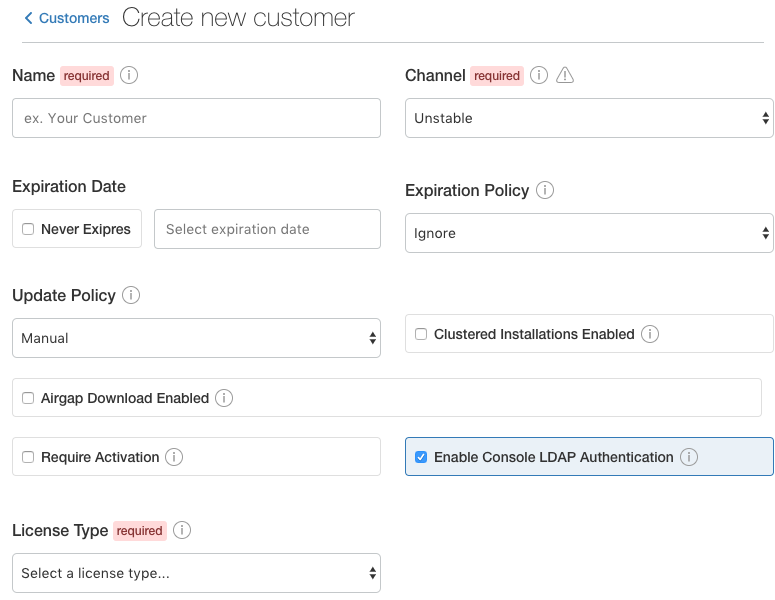 Each customer you deploy to via Replicated will need a separate license file for their installation. This license file identifies the customer & application during the installation and update processes. A customer license is created in the Customers section of the vendor portal. You can manage the values and properties of that customer and license, including custom license fields, by selecting an individual customer. If you are looking to create or manage custom license fields you can do so in the License Fields section of the vendor portal or via the Vendor License API. License values are used by Replicated to enable/disable various functionality, many of the values are also available in the on-prem instance via the license integration API. The name of the customer to whom this license is assigned. When you create a license you’ll need to assign it to at least one release channel. Stable channel is intended to be used for production installations. Unstable and Beta channels are intended for internal testing. More about release channel management. When a license is assigned to multiple channels, the customer will be able to select the channel at install time and later change the release channel in the management console. For airgapped installs, the channel can be selected at download time only. When you create a license you can specify how the license will behave when it expires. The policy can ignore expiration, allow a running application to continue but prevent updates, or stop the running application and prevent updates. License expiration to stop running the application is supported in Replicated 2.1.0 or newer. By default, licenses will be set to manual updates. This means that the end customer will need to read the release notes and click a button to apply the update. It is possible to turn on automatic updates, which will apply any update when it is detected. By default, licenses will be set to disable clustered installations. This will prevent the “add node” button from appearing on the Cluster tab of the on-prem admin console. By default, licenses will be set to disable airgap installations. By enabling this feature, the actual .rli file will have license meta data embedded in it and must be re-downloaded. The license file becomes the key to download & install your application. For this reason, it is wise to enable the license activation feature on all licenses. This will add a simple step to your customer’s installation experience, where the email you specify will be sent an activation code required to proceed past step 2 in the process. By default, licenses will be set to enable the admin to setup LDAP/AD as the method of authenticating into the on-prem admin console. By turning this feature off, the end customer will only see the options to keep authentication anonymous or to create a shared password for the admin console. Custom license fields can be set for all licenses. This is useful if specific customer information might change from customer to customer. These fields can be read from both the template functions as well as from the Integration API. Examples of custom license fields are “seats” to limit the number of active users or “hostname” in order to specify the domain that the application can be run on. When a license is archived in the vendor portal, it will be hidden in the default license search and become read-only. Archival does not affect the utility of license files downloaded before the change. If you wish for them to expire, set an expiration date and policy before archiving. This is a convenience feature for how licenses are displayed in the vendor portal.